Transparency Market Research (TMR) has published a new report titled, “Joint Replacement Devices Market - Global Industry Analysis, Size, Share, Growth, Trends, and Forecast, 2018–2026”. 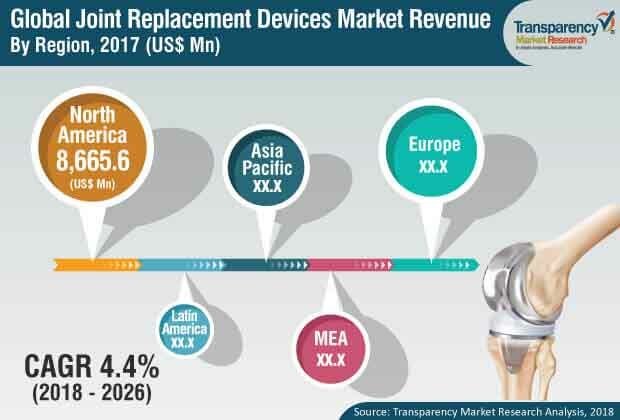 According to the report, the global joint replacement devices market was valued at US$ 18,518.2 Mn in 2017 and is anticipated expand at a CAGR of 4.4% from 2018 to 2026. High prevalence of osteoarthritis, growth in the medical devices industry in emerging economies in regions such as Asia Pacific, and launch of technological advanced products such as customized knee implants are projected to augment the global market between 2018 and 2026. Osteoarthritis is a common disorder that affects the adult and geriatric population across the globe. This condition can be treated through joint replacement surgeries using orthopedic knee and hip implants. According to the Arthritis Foundation, 14 million individuals in the U.S. had symptomatic knee osteoarthritis in 2016. According to the World Health Organization (WHO), 130 million people are likely to suffer from osteoarthritis worldwide, out of which 40 million people are projected to be severely disabled by the disease by 2050. Demand for medical devices used for surgical procedures and diagnosis of diseases is high. Increase in the number of market players launching new products for orthopedic surgeries, surge in hip and knee replacement procedures, and rise in emphasis on cost-effective health care boost the demand of orthopedic implants. Use of robotics and artificial intelligence in the health care setting has improved health care delivery and increased the demand for medical devices. Key players operating in the orthopedic industry are extensively engaged in research & development activities to develop new and upgrade existing devices for better application in joint replacement surgeries. This, in turn, is propelling the joint replacement devices market. Regulatory authorities such as the Food and Drug Administration (FDA) have recalled a number of hip and knee implants in the last few years. Defective products pose a threat to the patients and thus, render the surgery to be unsuccessful. Hence, product recalls are expected to restrain the market during the forecast period. For instance, in April 2018, FDA issued a recall for DePuy Attune Knee Replacement System, as the company failed to receive an FDA approval. In terms of revenue, the joint replacement devices market in Asia Pacific is projected to expand at a CAGR of 4.4% during the forecast period. Increase in awareness about the availability of orthopedic implants and rise in patient population in the region are expected to boost the demand for joint replacement devices. Furthermore, initiatives by governments to control the prices of joint replacement implants in the region is anticipated to create lucrative opportunities in the market in the next few years. The report also provides profiles of leading players operating in the global joint replacement devices market. These include Aesculap Implant Systems, Arthrex, Inc., ConforMIS, DePuy Synthes (a Johnson & Johnson Company), DJO Global, Exactech, Inc., Medtronic, Smith & Nephew, Stryker, and Zimmer Biomet. New product launches, focus on developing technologically advanced products, and increase in mergers & acquisitions and strategic collaborations with companies and government organizations are expected to drive the global market during the forecast period. In July 2016, Zimmer Biomet entered into a collaborative agreement with Indo UK Institutes of Health (IUIH) to improve the health care infrastructure in India by establishing Zimmer Biomet Institute of India.